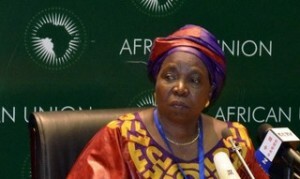 South Africa’s Dr. Nkosazana Dlamini-Zuma, 63, became the first female head of the African Union (AU) Commission, a post poised to test her leadership abilities to the limit, but also to potentially make her the ablest successor to President Jacob Zuma. In the apt words of one government official, “Ms Dlamini-Zuma’s job is not a poisoned chalice, but it would be a very difficult one”. Stepping into her new Chinese-built office in Addis Ababa on Monday, Madame Zuma spelt out her priority as conflict resolution in hotspots like Mali, the Sahel, and the Democratic Republic of Congo. But the vexing issue in her hands is to heal the festering wounds left by the long-drawn-out battle with the former chair, Dr Jean Ping of Gabon, who she narrowly defeated. A vote at a summit in January deadlocked, with neither of the two securing the required two-thirds majority, giving Dr Ping another six months in office. Ms Zuma narrowly won a repeat vote in July—garnering 37 votes of the eligible 51—in what the Africa Intelligencechristened “a diplomatic coup in Addis Ababa.” Critics aver that Madame Zuma’s ex-husband, President Jacob Zuma, pulled all the stops, flexing Pretoria’s financial and diplomatic might to ensure her victory at all costs. Africans are more divided than in the ante-bellum. The French-English speakers fault line grew wider as the former supported Ping and the latter Dlamini. Not even the voting against the grain by Kenya, Nigeria, Cote d’Ivoire, Algeria, Chad, Congo Kinshasa and Senegal could blur the divide. However, Madame Zuma is confident, battle-hardened and up to the task. She has an impressive career as a diplomat who clearly knows the ropes of African and world politics. As Pretoria’s Minister for Foreign Affairs (1999-2009), she spearhead Thabo Mbeki’s African Renaissance project abroad, overseeing the switch from the Organization of African Unity (OAU) to a reformed African Union. The tailwind of African development is in her favor. After decades of afro-pessimism, the continent is now touted as the El Dorado of 21st Century, with Real GDP averaging at 4.9% a year from 2000. Natural resources account only for a third of this growth with telecommunications, transport, manufacturing and wholesale trade driving the rest of this turnaround.A normative and legal framework that the AU erected since 2002 has spurred political reforms, directly contributing to this bliss. African soldiers and peace-makers have ended protected conflicts in Sudan, Angola, Liberia and Sierra Leone; resolved post-election conflicts in Cote d’Ivoire and Kenya; and reversed power grabs by military juntas in Guinea Bissau and Mauritania. The African Mission in Somalia (AMISOM) has dislodged the Al-Qaeda-linked Al Shaabab militia from its Kismayo hub since September 2012. The Union’s Peace and Security Council (PSC) is mandated to intervene in member states to halt genocide and crimes against humanity. The Africa Peer Review Mechanism (APRM) is regularly auditing states’ performance in democracy. The coming into force of the African Charter on Democracy, Elections and Governance in February provides an authentic roadmap to a democratic future. Regional Economic Communities (RECs) like the East African Community are creating harmonized budgets, common currency, free trade and common approaches to security. However, with 65% of Africa’s 1.1 billion people being less than 35 years, the youth bulge is a ticking time-bomb. The Zuma-led AUC need to fast-track the execution of the Declaration on Creating Employment for Accelerating Youth Development and Empowerment recently adopted in Malabo, Equatorial Guinea. Zuma’s accent on stability is apt, but the character of security threats is changing rapidly. A continental framework is needed to stem the surge of extremist groups allied to Al-Qaeda in Maghreb Africa, the Al-Shabab in Somalia, Boko Haram in Nigeria, or the Mombasa Republic Council (MRC) in Kenya as the newest threat to continental peace. Over-reliance on donor funding to roll out action undermines the spirit of African freedom. It is a crying shame that nearly 50 years after its predecessor (OAU) was formed, the Chinese spent over $200 million to set up the AU headquarters. The AU must devise viable ways of getting its member states and Diaspora to carry Africa’s burdens or allow those paying the piper to call the tune! Africa must have a common stand on the International Criminal Court, which has indicted leaders from Ivory Coast to Kenya to, Libya to Congo. The venue of the AU July summit had to be re-located to Addis Ababa when Malawian President, Joyce Banda, declined to host her peers in Lilongwe, wary that the Sudanese leader, Omar al-Bashir, indicted by the ICC, would attend and imperil her relations with the Court’s international backers. These are key scenarios Dr Zuma and her team will have to contend with. To succeed, she needs to diffuse any real or imagined fault lines between the colonially constructed Francophones and Anglophones.